Not all ants bite, some can also sting. The ants bite and sting as a defense mechanism if they believe that they are in danger. They also release an acid, which is why a sting or a bite turns red and itchy. Ants is an umbrella term that encompasses over 12, 500 known species from 22,000 species. Ants are believed to have evolved from wasp-like ancestorsover 110 and 130 million years ago and belong to the Hymenopteraorder of the Formicidaefamily. Ants are known for their ability to form tight-knit colonies and also for being able to carry twice it body weight. Their colonies consist of classes such as workers, soldiers, drones and queens. Ants have colonized almost every landmass on Earth, except Antarctica, Greenland, Iceland, parts of Polynesia and the Hawaiian Islands lack native ant species. Two of the most common type of ants are: the common black ant (Lasius niger) and the common red ant (Myrmica rubra). 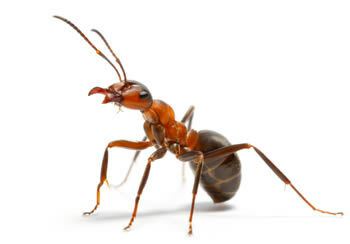 There are also other ants such as the Bullet Ant, Fire Ant, Carpenter Ants, etc. However, one must remember that no all ants bite, some sting. Ants fall under three categories: one who bite, one who sting and one who do nothing. The ants that bite have powerful mandibles, while others have a powerful stinger. They also inject the bite or sting mark with spraying chemicals such as formic acid, alkaloids, piperidines or protein acids. These result in the redness and the itchy. Depending on the ant, the bite mark can hardly hurt or can be quite painful. Some stings (like those of Bullet Ants) are considered to have the most painful sting. While, some stings can be fatal such as of those of jumper ants can also be fatal. Most commonly biting and stinging is often used to defend themselves against prey, while other times it can be to kill a prey. In some cases it has been observed that the ants use their jaws as a catapult to eject intruders or fling themselves backward to escape a threat.